The great thing about this activity is how it seems as though it is going to be easy and then isn't at all. This combined with its practical nature offers a good and engaging starting point that means there is instant activity. Students reason with each other about the shape and dimensions of the net and discover the complexities of the problem one by one and then puzzle to solve them. 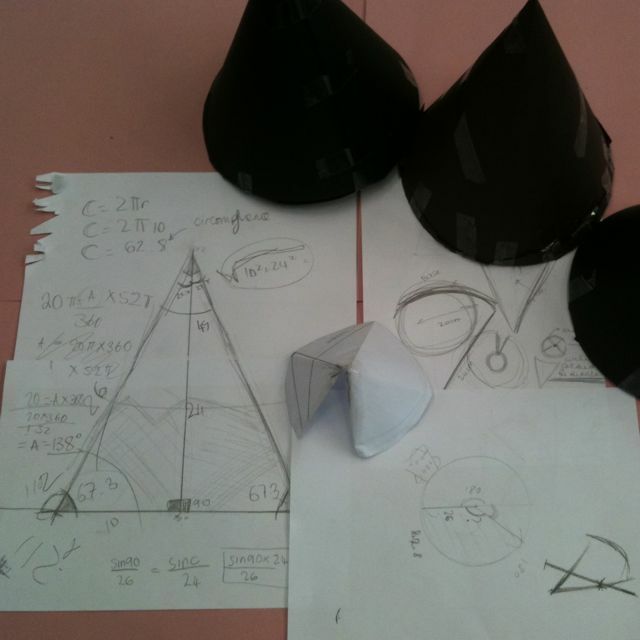 It offers a great opportunity for students to explore mathematics and bring meaning to the associated formulae for cones that can otherwise seem abstract when they are only asked to apply the formulae to different shapes. Students will find themselves playing with mathematics! The following is some practical advice about how the activity might be run and how to prepare. Resources given and needed are outlined on the activity page. Teachers may want to add a little time to go through the exercise themselves to that list. There is plenty of time during the activity for teachers and students to do this together though and that can be nice. With careful teacher input, this activity can be done in an hour. Much depends on how far the teacher wants to take the activity. Often the simple creation of the cone is enough to bring out some rich activity, discussion and mathematics. Some groups will want to go on to do the algebraic proof of the surface area of a cone though. The task is simply explained and the activity is easily started by printing and copying the short worksheet. I think the task works best in groups and so teachers may want to consider these groups beforehand. Teachers should be prepared to input at each of the different stages just to help the groups move along. It can be nice to ask groups that have discovered things to share it with the other groups. As suggested already, the creation of the cones makes for a good end requirement. The proof of the formula for the surface area of the cone could be another. The cones themselves displayed in the classroom are probably the best record of this activity. Teachers may follow this up with some demonstration and practice of the formula in action which could also make for a good record. What is the shape of the net for the curved surface area? Students should be encouraged to make conjectures here and try them out to reason themselves closer to the answer. Pythagoras's theorem is required to work out the slant height (the radius of the net for the curved surface area) of the cone. The arc length of the curved surface area is equal to the circumference of the base. This is the trickiest part and students may need help to negotiate this algebraic equivalence. The result leads to the angle of the sector that makes the net for the curved surface. The principle above is what leads to a general algebraic proof. Equate the base circumference to the arc length of the sector that makes the curved surface area.